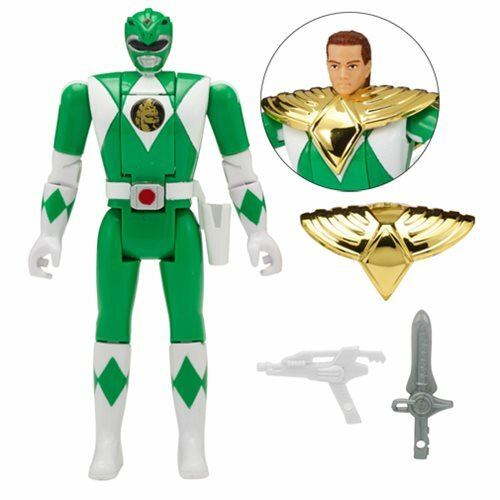 The Legacy Mighty Morphin Power Rangers Auto Morphin Tommy Figure is a reissue of the morphinomenal 90s hit toy. Just like back in the day… "It's Morphin' Time!" Morph your favorite teen into a Power Ranger by pushing down quickly on the Power Morpher Belt Buckle. To change back into a teenager, rotate the helmet back and down until the teenage head is on top and the chest and back panels are closed. Now you're ready to morph again!" Collect the full Ranger team (each sold separately) to combine their weapons into the Power Blaster. Collectable retro blister card comes inside a premium window box package.